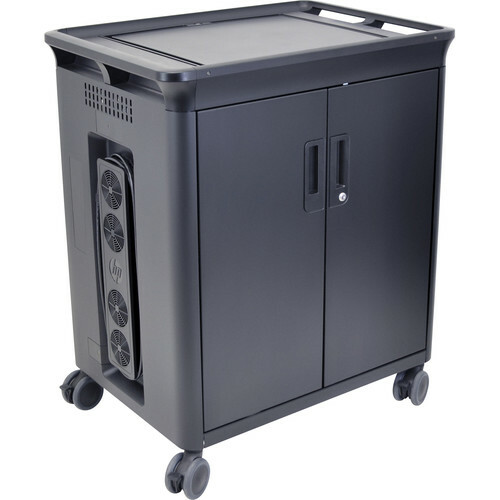 Keep up to 20 notebooks and tablets updated and charged in environments such as education, hospitality, and more with the HP 20 Mgd Charging Cart V2, a sturdy, lockable rolling cart designed to securely house, charge, and push software updates simultaneously. Move the cart between offices, classrooms, and more with integrated hand grips and four swiveling, lockable casters. Then park the cart, fold the retractable doors back into the unit, and load and unload your devices as needed. Recharge PCs with Power Shuttle 2.0, which scans and distributes power to your devices. LED indicators are easy to read, and venting and four fans keeps devices cool. Charge extra devices outside the cart with two auxiliary outlets. Box Dimensions (LxWxH) 48.0 x 40.0 x 29.0"